Presenting Tennessee Williams’ “The Glass Menagerie” is tricky. Inarguably, it is a great American play, by a great Southern playwright. Even the most novice theatre-lover has seen it, probably several times. We seemingly never get tired of it. I know I don’t. The trick is how can it be produced — again — and give it new… new what? Meaning? Relevance? Life? 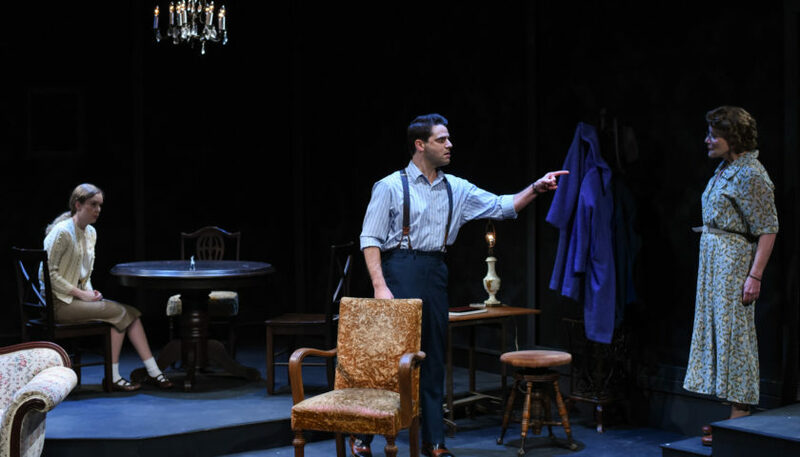 Currently, “The Glass Menagerie” is playing at The Warehouse Theatre in Greenville, and it is… as good as it gets. It’s very good. It’s very good in that I didn’t really notice anything off about it. Each time I see it (about once a year, it seems), I like to note the sometimes subtle/sometimes odd bits of variance — a Merchant Marine costume here, an Austrian curtain there. With this one, I noticed how simply unfussy it was, and that in itself might be the most worthwhile element of this production. Everyone did his or her job well, and the show got a much-deserved full-house standing ovation on opening night. I don’t pretend to know the mind of Mr. Williams, but I can’t help believe this production may be the prime example what he originally intended. A sad story about sad people told in engaging ways and in an intimate environment. The result: dramatic insight into the human condition. I mean, really, would you ever think you’d interested in a slightly physically crippled but overwhelmingly emotionally crippled young woman — Laura — who sits around all day playing with little glass animals. Or her overbearing transplanted-southern mother — Amanda — who would drive anyone insane with her wild mood swings, constant nagging, worrying, bullying, manipulating, and guilt tripping. Or, the brother/son — Tom — the story’s narrator and emotionally injured male lead who’s being torn asunder by everything — his sister, mother, job, poetry, smoking, the Merchant Marines, going to the movies at 2 a.m. every night of the week. There are two more characters: the runaway father, who left 16 years ago but who’s blank image looms in the living room setting, and the unwitting “gentleman caller” who has been targeted as a much-needed suitor for Laura. All five characters carried about the same amount influence on the situation, even if, Amanda and Tom seem to get more lines. In this memory play, Tom — played by Thomas Azar — through his recalled memories gives us access to a pivotal moment in time in his and his family’s lives — when several life issues have collided. The place is St. Louis, 1937, in ratty lower-middle class apartment that is getting rattier all the time. Amanda is at her breaking point to find financial security for her daughter Laura. Laura has barfed at business school and secretly dropped out. And Tom is just unhappy and justly so with everything. From the beginning, this play was never about realism. It is a tainted memory. The more immediate tension is that Amanda has strong-armed Tom into bringing a warehouse co-worker — Jim — home for dinner — to meet Laura. There’s no doubt about it: getting Laura a husband is the focus, but Laura is anything but focused. To say the least, things don’t work out as planned, as they seldom do in life. Like I said, a sad story about sad people. But told in an engaging ways. Therein lies the trick: how the story is told. At The Warehouse Theatre, Director Kerrie Seymour wrote in the playbill: “I asked myself, ‘What makes this play alive and urgent right now?’” I think the best answer to that question is at the heart of the play. Life is complex, and at times difficult. How do we play the cards dealt us? Are such basic universal truths any less true today than they were when the play opened in 1944? For The Warehouse Theatre to have captured and recreated that time and place and those people so perfectly is like having your great great grandmother’s custom-made engagement ring and wearing it never goes out of style. And then you crack the stone, and people want to see it even more. Veteran actress Mimi Wyche plays Amanda with alarming ease. Amanda is one of those over-the-top characters we love and hate at the same time. She’s an attention magnet, whose attraction power has greatly weakened with hard times. So, she tries ever harder to get attention and instead gets disdain. Wyche is an accomplished actor with solid credentials and varied experiences all of which gives her the personal insight to understand and channel a character with overflowing undercurrents of a life unfulfilled. Azar is a good choice for Tom, a character who has to wear more than one ill-fitting hat. There is a purposeful distance about Tom, who often looks far away and away from his current situation. As an actor Azar captured the overlapping senses of regret, resentment, hope and hopelessness, entrapment, and several other mostly negative qualities. But he didn’t milk them, which would be so easy to do, and would have probably lead patrons to dislike the character. Instead, we see him as a victim and a guy we might like under different circumstances. Personally, I think the hardest character to play is that of Laura, who was played by Kathryn Hinton, a recent Clemson grad now living in Atlanta. Early on in the play, Laura is established as a girl broken in more ways than one. Impossibly shy, maybe simple minded, certainly riddled with anxiety, and fearful of everything. Considering that Hinton has once played Blanche in “A Streetcar Named Desire,” she is a flexible actor. It’s not really until the second act that we begin to see the possibilities of Laura breaking free of her self-imposed imprisonment. Once her mother has left the room and with a lot of coaxing from the gentleman caller — played by Drew Whitley — Laura shows hints of coming out of her shell, only to be stonewalled, all within a somewhat lengthy but very important interlude of two. It takes a strong actor to be Laura, and Hinton rises to the occasion with restrained subtlety and insight. As the gentleman caller, Jim is the fish out of the water and whose purpose is to be caught. Whitley brings the intended breath of fresh air to the stifling room. His is everything Amanda ever wanted in a son-in-law: charming, ambitious, hard-working, good looking, smart — pretty all the things that her estranged husband was. As an actor, Whitley has to do an about-face when he learns that the dinner meeting was not by chance and had intentions of marriage. He went from the target of attention to a moving target trying to leave as gracefully as possible. Being Jim is not a small role, but a role that confirms just how doomed the other characters are. You can never see “The Glass Menagerie” too many times. Each time and if told well, we learn a little more, we see another symbolism, we understand a little deeper. The Warehouse Theatre and this cast are telling us a story told countless times before. The trick is they are telling it as it was meant to be told. Designs for “The Glass Menagerie” are created by Michael J. Riha (scenic), Jessica Snyder (costumes), Marc Gwinn (sound), Kevin Frazier (lighting), and Cassidy Bowles (properties). “The Glass Menagerie” continues through Feb. 10 at The Warehouse Theatre, 37 Augusta St. in Greenville. 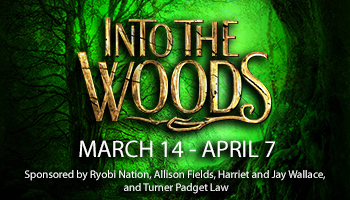 For tickets, call (864) 235-6948 or visit https://warehousetheatre.com.